This has been so much fun Pam and it’s all because of you. I’ve received 2 calls from people wanting to save their pink bathrooms and one of them wants to work on the kitchen and rest of her mid century house. I hope I can work with them. My 19 year old son thinks this is so cool. He wants your kitchen Pam. I’ll be touch. Keep up the good work. Woot! Take lots of photos, Carri, and I’ll showcase them on the blog. I love this! Spoke with both of them tonight. They are so excited to save their pink bathrooms. I will be sure to let you know what we are doing. Thanks again. This is a blast! 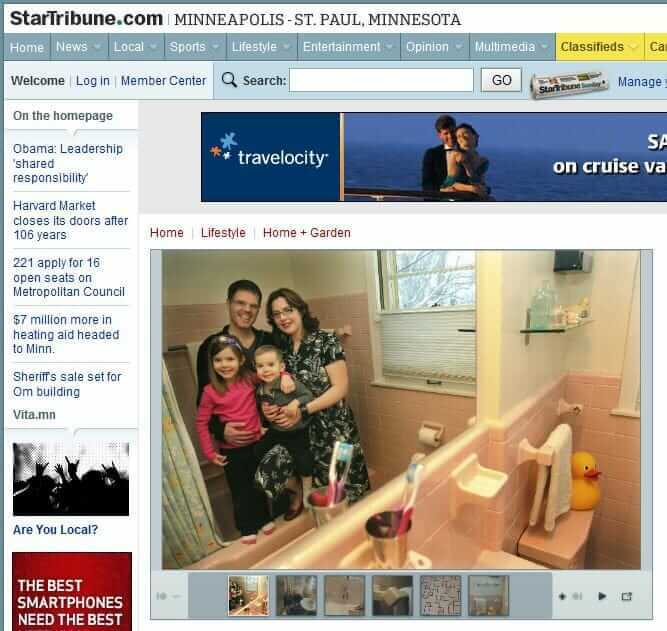 Loved the Pink Bath Article in the Star Tribune!! See http://www.ResidentialRelics.com / Bath Accessories / Cup and Toothbrush Holders for photos. Hi all- I lived in Mpls too and there are a ton of mid mod homes, especially in all of the suburbs. I lived in Hopkins for 14 years….wanted to buy a ranch home but decided to move back to MI to find my dream home. Well, I almost bought one in Brooklyn Park. My original apt in St. Louis Pk had a pink bathroom. We could be Midwest Mid Mod! The same day I found this site, I saw a House Hunters show on HGTV where they looked at a mid-modern ranch house with one pink bathroom, one blue bathroom and a blue metal cabinet kitchen. Of course they said they’d have to blow it all out. It didn’t help that the house was very run down and had some odd Asian themed living room. Very sad. They did choose this house and gutted it. I think the real turn off is that things are dirty and run down rather than just looking dated. They should have a show about restoring and cleaning up these vintage houses. Kind of like the Pawn Stars spin off show about the guy who restores old stuff like Coke machines only for home interiors.